Advanced Cardio RX Reviews - Is This "CardioRX" Any Good? What Exactly Is The Advanced Cardio RX? Created by Edward Walters, a health professional, the Advanced CardioRX is a dietary supplement that contains “The Missing Omega” for total heart health. EPA (eicosapentaenoic acid) – This omega-3 fatty acid is usually found in the flesh of cold-water fatty fishes, such as halibut, herring, mackerel, salmon, and tuna. People with high trigylcerides (a type of fat found in the blood), hypertension (abnormally high blood pressure), coronary heart disease, and inflammation. DHA (docosahexaenoic acid) – This is also found naturally in cold-water fishes and breast milk. When inside the body, this can be converted into EPA. Many people use this for preventing or treating age-related eye disease, depression, behavior problems, type 2 diabetes, and heart disease. These two are often combined in fish oil preparations to alleviate a variety of conditions, such as heart disease, heartbeat abnormalities, and menstrual problems. So, what’s special about “The Missing Omega”? On their video presentation, they mentioned a Harvard University study with more than 30,000 participants. Researchers discovered that those participants who had increased amounts of “The Missing Omega” had better heart health than those who didn’t have it. This fatty acid works in different ways. It reduces your risk of heart attack and stroke by fighting deadly blood clots and inflammation. It also increases your metabolism and energy levels, improves your brain function, and promotes better overall health. How do you take the Advanced Cardio RX? Each bottle of this dietary supplement contains 60 capsules. You take two capsules of this supplement daily. You can buy this per bottle or buy it in bulk (3-bottle package and 6-bottle package). Click Here To Learn More About The Different Packages They Offer! It’s not that hard to search for these medical journals and studies online. While there are no sources of information that are specific to this supplement, it’s still comforting to know that scientists and medical researchers have looked into the effectiveness and safeness of these fatty acids. Do you eat too much fast food? Do you like sugary and deep-fried foods? If yes, you need to fix your diet. Eat more cold-water fishes. Avoid eating foods that are rich in bad fats and sugar. According to the University of Rochester Medical Center , the majority of Americans eat too much fatty or high-calorie foods. Taking dietary supplements, such as the Advanced CardioRX, can also help to improve your overall health and lower your risk for heart disease and other diseases. There’s really nothing you need to do. You just swallow two capsules of Advanced Cardio RX per day. That’s it. This may take you only a minute or less. It doesn’t matter if you buy only one bottle or six bottles. Shipping is free for all customers who are living in the U.S. or U.S. territories. You have 180 days or roughly six months to test the Advanced CardioRX. Normally, it takes at least two to three months before a supplement produces significant results. If it doesn’t help improve your heart health or overall health, simply email them to get a full refund. Don’t take the Advanced CardioRX to treat an existing medical condition. There’s a reason it’s called a dietary supplement, not a pharmaceutical drug. So, don’t stop taking your meds or take this supplement with your meds without consulting your doctor first. Fish oil supplements containing DHA and EPA are most likely safe if you don’t take more than 3,000 mg each day, according to the Food and Drug Administration (FDA). Some of the possible side effects of these fatty acids are bruising, burping, diarrhea, fishy taste in the mouth, nausea, and nosebleeds. Taking DHA and EPA with meals could lessen these side effects. They Don’t Ship Outside the U.S.
At the moment, they only ship the Advanced Cardio RX supplement within the U.S. or U.S. territories, such as Guam. The Centers for Disease Control and Prevention (CDC) estimates that more than 600,000 Americans die from heart disease every year. That’s one in every four deaths. Now, we’re not trying to scare you. We’re just stating a fact. With the high prevalence of heart disease, it’s no wonder people will do just about anything to avoid or treat it. In most cases, the right diet, physical activity, and lifestyle choices could decrease your risk. If you have a poor diet, perhaps a dietary supplement may help. A study published in the Nutrition Journal says that American adults don’t consume enough fish or meet the recommended omega-3 fatty acid intake. However, not all dietary supplements are effective or safe, and it is always recommended to ask your doctor for his or her recommendations. 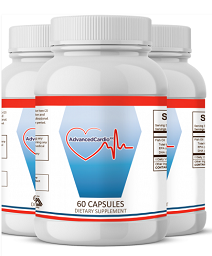 Regarding Advanced CardioRX, while there’s no guarantee that this will completely shield you from any type of heart disease, stroke, or heart attack, we do believe that this supplement can be very helpful for many people. So far, we didn’t find any negative feedback about it online, and the ingredients used in this supplement seem of high quality. Overall, if you don’t eat enough cold-water fatty fish, if you’re at risk of heart disease, and if you don’t have a serious medical condition that affects the heart, then the Advanced CardioRX is a great option to consider. Click Here to Learn More About Advanced CardioRX, And Check Out the Special Discounted Prices That Are Currently Available Online!